The elderly home provides helpful care and services to the elderly of the community in conditions of social vulnerability, and desperately need assistance and aid. The majority of the elderly were relocated by the government because of inadequate living conditions due to lack of economic resources, abandonment from family members, or were found to be in neglectful situations. Besides needing emotional healing and therapy, the majority also need a great deal of physical and medical assistance. Depending on the state of the elder’s current health conditions they might need help with even basic day-to-day functions, medication distribution, IVs, emergency response, and more depending on their health. This is an interesting and meaningful project for anyone interested in pursuing a profession in healthcare or social work as it requires hands-on work with the elders. Beginner to intermediate knowledge of Spanish is preferred (but not mandatory). If a participant cannot speak Spanish, we suggest that he or she enrolls in our Spanish language program as it will make their stay and experience more rewarding for both the participant and the elderly being cared for. There are no specific qualifications needed to join this participant project in Costa Rica. All participant are expected to be open-minded, flexible, patient, and to possess a passion and love for the participant service they are providing. Participants should come prepared with their passport in-hand for their first day of participation. **All Healthcare participant must bring scrubs and evidence of their level of education and experience. Participants will have the chance to work hands-on with the elders and make a real difference in their lives. Participants will create strong friendships, help to serve healthy food, read to, play interesting games, or put on fun activities for the elders daily. In some cases they will be responsible for physically assisting elders with day to day tasks including helping with medications. 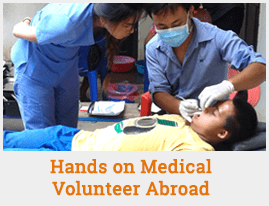 Tasks the participant may take part in are taking vitals sign, giving IVs, and more depending on their education and experience. Get your scrubs on! Participants staying at the program headquarters can expect apartment-style housing with access to their own kitchen, shared rooms and bathrooms, Wi-Fi, television/cable, and optional A/C and laundry service. Participants additionally will be living on-site for Spanish classes, weekly meetings, and local community development opportunities. Participants receive three light meals per day at either accommodation. Host Families are well-screened and offer participants a shared bathroom, private bedroom, electricity, and running water. Headquarters housing offers participants shared bathrooms, hostel-style bedrooms, electricity, running water, and WiF. Participants receive three light traditional meals per day at either accommodations.